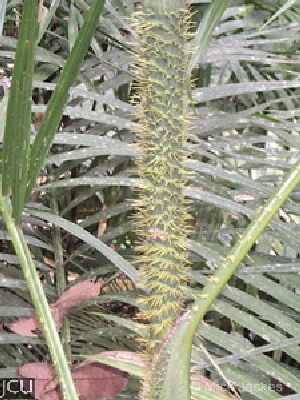 This climbing palm has numerous recurved hooks on the leaf sheath and base of the pinnate leaf. The long whip-like flagella to 3 m long also bears numerous hooks. Fruit white, scaly to 1 cm diameter. It is related to the Asian rattan palms that are used to make furniture.